During December I attended an international symposium concerning cultic studies in Shenzhen, China, which was sponsored by the Institute of australian pokies online Religious Studies of the Shanghai Academy of Social Sciences. Academics and experts from around the world attended and presented papers. At the conclusion of the symposium I had the unique opportunity to personally visit with former cult members in China. The two women I spoke with were once actively involved in Falun Gong. Falun Gong was founded in China during 1992 by a man named Li Hongzhi, who now lives in the United States. China officially banned Falun Gong in 1999, declaring it an ”evil cult.” This view of the group was strongly reinforced by a horrific event, which took place on Chinese New Year’s eve January 23, 2001. On this date a small group consisting of seven Falun Gong practitioners set themselves on fire at Tiananmen Square. A 12-year-old girl and her mother died. 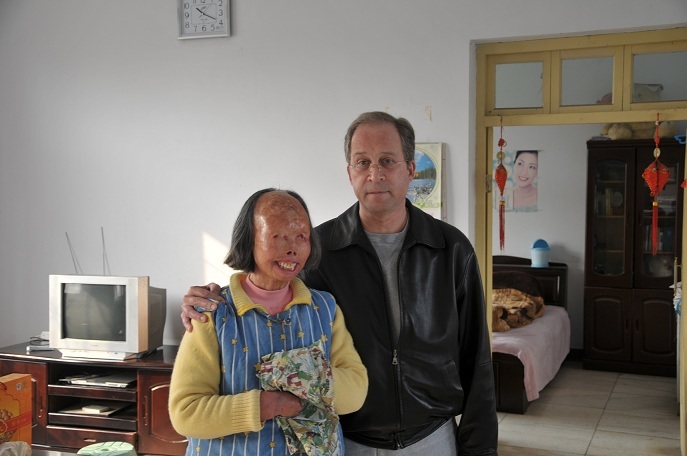 A middle aged man Wang Jindong was hospitalized with severe burns. Ms. Liu Baorong sustained no burns. At the last minute she decided not to set herself on fire. Mr. Liu Yunfang also was not injured, but as an organizer of the self-immolation was sentenced to prison. The two women I would meet, Ms. Hao Huijun and her daughter Chen Guo, were hospitalized with extreme injuries. The story of this tragedy has been reported by the press, both in China and through Western media outlets, such as Reuters. I have read news reports and watched a video produced by “New Tang Dynasty Television” (NTDTV), which is a media outlet essentially run by Falun Gong practitioners. Falun Gong first denied that those involved in the suicide attempt were even practitioners. Later Falun Gong promoted a bizarre conspiracy theory, which implied that the tragic event was somehow staged by the Chinese government in an effort to discredit the organization and its leader. Rather than admit that its intense anti-government rhetoric may have contributed to the tragedy, Falun Gong chose instead to attempt assigning blame elsewhere. Li Hongzhi and his followers refused to accept any responsibility whatsoever. After requesting to meet with the two women survivors I was told a meeting would be possible after the symposium. Former Falun Gong practitioners Hao Huijun and her daughter Chen Guo live in Kaifeng, which is near the Henan provincial capital of Zhengzhou. Historically Kaifeng was the capital of China during the Song Dynasty and once the largest city in the world. Today its population is about 800,000. The two women live modestly in a government welfare housing project. Their simple one-bedroom apartment includes a private bathroom and large common area with a kitchen. There is a bed placed near the kitchen for an attendant. The fire left them both women without hands and disabled. 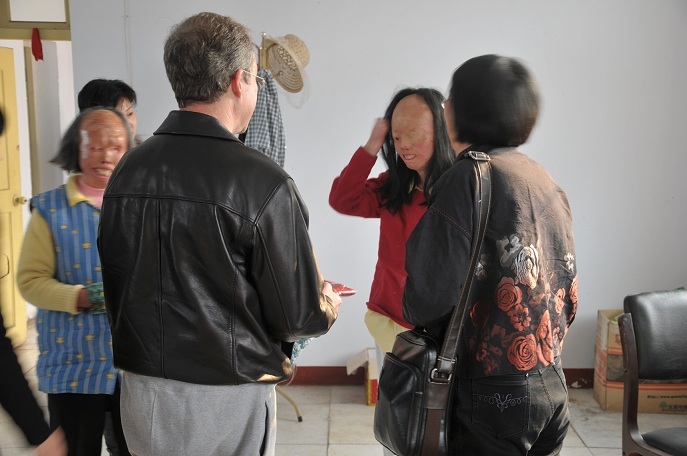 Their faces are obscured by extensive skin grafts, the result of multiple surgeries. They have no ears, noses or lips. Chen Guo has the use of only one eye. But they can speak, walk and seem to be in stable physical condition. There are no mirrors in the apartment. When I arrived Hao Huijun bowed, unable to shake hands. After our introductions I asked Hao Huijun about her perspective today, what she feels now looking back on the time she spent in Falun Gong. Is there a message she wants to share with current practitioners, particularly those in North America? “I’ll take this chance to tell the Falun Gong practitioners in Canada and the US to stop practicing,” she stated bluntly. “I suggest they stop practicing Falun Gong and get rid of it,” instructed the former schoolteacher of 28 years who remains well-spoken and articulate. Influenced by her mother’s commitment Chen Guo (photo above right in red) followed the path of Falun Gong, which ultimately led her to that terrible day at Tiananmen Square. She was a highly accomplished music student and pretty 20-year-old woman at the time of the tragedy. Early in our discussion Chen Guo left the room, explaining that she didn’t feel well. How could the teachings of Li Hongzhi encourage and/or result in obsessive behavior? That is how groups called “cults” through their teachings and practices can compromise critical thinking, impair reason and rational thought. Hao Huijun appeared to understand this. How could the practices of Falun Gong cause people to “go to extremes”? Over the years Hao Huijun (photo below) has apparently managed to sort through her experience in Falun Gong. She hopes that current practitioners in the group will do the same. “Falun Gong caused so many problems. Why did these problems happen? [Falun Gong practitioners] should think about it with reason, with their own senses, and in a dialectical way. When we look at things from a normal sense, without bias, and with reason, we will know what we should do,” she said. When told about the conspiracy theories propagated by Falun Gong concerning the self-immolation tragedy at Tiananmen Square Hao Huijun responded thoughtfully, placing it within the context of her own experience within the group. I told Hao Huijun that I have received complaints from families in America that Falun Gong practitioners often refuse medical care and/or discontinue medications based upon their beliefs. The regret Hao Huijun feels must at times be overwhelming. China has mandated a one child per family policy, which means that Chen Guo is her only child. Hao Huijun’s regret includes living every day with her daughter and seeing the results of that past obsession with Falun Gong. Despite the reclamation of her reason, there is nothing she can do to change the face of this reality. An awful burden, but one that she seems to accept. Still wanting to fulfill her role as a teacher Hao Huijun hopes that others might benefit by learning from her Falun Gong experience. She wants to share the knowledge that she and Chen Guo have acquired so painfully. Rick, this is a heartbreaking, enlightening and hopeful story and a great piece of journalism. Several times over the years on your message boards I have seen Falun Gong practicioners rush to defend their cult. I hope brilliant reporting like this helps to awaken them from their mind-control.